Buy Appesat Slimming Tablets UK? The UK has gone slimming tablet crazy with another over the counter product recieving large amounts of television, radio, newspaper and magazine coverage and column inches. Appesat is the new seaweed slimming tablet that trains people to eat less and educates your stomach into expecting and wanting less food. Featured in Marie Claire, the Telegraph newspaper as well as numerous TV and radio news buletins, Appesat certainly has the marketing funds. Although the media coverage focuses on new – strictly speaking Appesat is not entirely new. 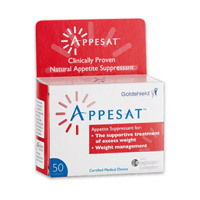 Consumers have been able to buy Appesat for several months albeit direct from the company responsible, Goldshield. Now, Appesat is sold in Boots the Chemist, Holland and Barretts, Tesco even Sainsburys. It is very early days and far too soon to pass absolute judgement – although health experts are concerned at the possible long term effects the Bioginate Complex (seaweed extract) could have. The seaweed is responsible for expanding in the stomach and creating a full feeling – otherwise known as suppressing appetite. As described above many high street suppliers are selling Appesat including Boots, Holland and Barrett as well as major supermarkets. There is little doubt that the company responsible will make big profits but at what future cost? The whole wonder slimming tablet that works by training you to eat less was done several years ago and to greater effect by cactus extract. PhenQ – a fat burner, appetite suppressant and fat blocker formulated to effectively reduce your calorie consumption by nearly 300 per day while preventing 27% of the fat that you eat from appearing on your stomach, hips and thighs. PhenQ is clinically proven, certified and available to buy without prescription.